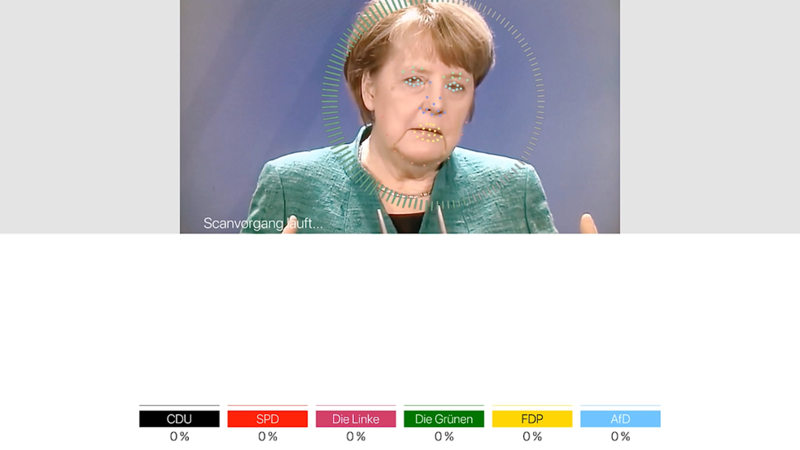 The average CDU voter has a strong chin. Anyone with a small, finely shaped nose votes for the Greens. And a high forehead is a sure sign of an SPD supporter. A load of nonsense, a bunch of baloney? Maybe – but maybe not. 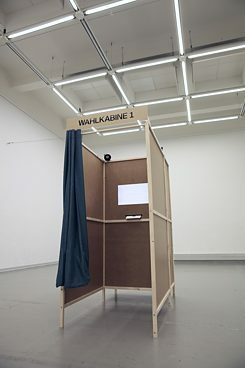 Berlin media artist Alexander Peterhaensel designed a voting booth that purports to be able to determine anyone’s political convictions by scanning their face and then casts their vote. The whole process takes only seconds: the voter looks briefly into the camera, the rest is automatic. Inventor and marketer of the fictitious voting booth is the similarly fictitious company Smile to Vote. Smile to Vote – Political Physiognomy Analytics is only an art project. But the notion of such a voting booth is not totally preposterous because it is based on technologies and methodologies that are already in use in other areas. Peterhaensel’s inspiration came from the research findings of American psychologist and Standford University professor Michal Kosinski. In a study published in 2017, Kosinski claims that software can reliably deduce from people’s faces whether they are homo- or heterosexual. On the basis of just a passport photograph, the artificial intelligence system is said to be able to guess correctly whether a man is gay or straight in 81 percent of cases. With women, the success rate is claimed to be 74 percent. The AI works by comparing the subject’s image with a dataset of images of hetero- and homosexual individuals and spotting similarities. The Smile to Vote scan | Photo: Smile to Vote, Screenshot psychometrische Analysesoftware © Alexander Peterhaensel 2017 Peterhaensel was amazed by the results. For his art project, he applied the same basic idea to people’s political convictions: the Smile to Vote voting booth compares the voter’s face with a data pool of photographs of politicians. In an instant, the system draws conclusions about the subject’s – supposed – political leanings. There is no need for the voter to confirm the result; according to the project, it is transmitted as a valid vote directly to the relevant electoral authority. Peterhaensel’s project aims to flag up the implications for society when more and more decisions are delegated to IT systems. It is an issue that has worried him for a long time – especially considering how willing politicians and people are to place their trust in algorithms and disclose personal data. In the run-up to the Bundestag elections in 2017, Peterhaensel says, he was particularly struck by the “terrifying scale of political decision-makers’ ignorance about artificial intelligence and facial recognition”. Facial recognition makes it possible, amongst other things, for any person whose biometric data is on file to be identified on camera by software. Apple Inc., for example, uses powerful facial recognition technologies in mobile phones with its Face ID feature, creating high-resolution physiognomic datasets of users. And Chinese IT giant Alibaba introduced payment by facial recognition at a fast food restaurant back in 2017. “In that instance, facial recognition becomes a desirable, fashionable lifestyle product without the user being aware of the loss of privacy and the delegation of decisions to IT systems.” Alibaba’s Smile to pay system inspired the title of Peterhaensel’s art project. The voting booth where the voter’s physiognomy is scanned. | Photo: Smile to Vote, Wahlkabine © Alexander Peterhaensel 2017 The Smile to Vote voting booth really exists. But the voting system is fictitious and so is the company behind it. One of the aims of the multi-perspective concept art work, however, is to make both seem as real as possible. The fictitious GovTech startup Smile to Vote thus features in a deceptively realistic website: “It is also an aesthetic criticism of the IT industry,” says Peterhaensel, who is an artistic research associate at the Institute of Time-Based Media of the University of the Arts Berlin. Peterhaensel himself is a part of Smile to Vote. On his travels or even when he is just out and about, he invariably has the fictitious company’s calling card in his pocket. If he runs into an investor who offers financial backing for the startup, the ensuing ‘business meeting’ becomes a performance. And that results in something else that Peterhaensel targets in Smile to Vote: the “magical realism or hyperrealism” that stems from the oscillation between the plausible and the fantastical.